2048 is a very famous game enormously liked by people. 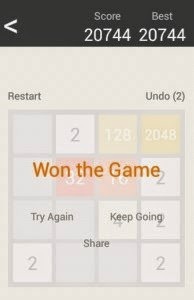 As a single user game 2048 having 16 boxes is spreading viral and users are playing it on both PC and android Devices. Interface of this game is so simple and once you play, you will like it. Simply based on mathematics I found 2048 a hilarious and spectacular game I ever played. In 2048 you find different digits in the blocks in 4*4 grid shape and you have to complete 2048 by sliding the digits by arrow on PC Keyboard in any direction. As you you have reached up to 2048 you have won the game. You are your own rival in this game. At then time I was playing this game In I got stuck at 1024. I searched hither and thither how to cross over this stage I fond an article on Howtoconnect very helpful and I could reach upto 2048 and won after reading this.